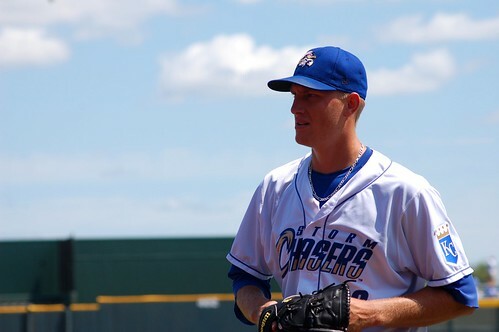 Dyson’s having a good season for the Storm Chasers, increasing his walk rate while cutting his strikeout rate. And, you know, he runs…not slowly. Manager Mike Jirschele loves him some sac bunts, so Dyson has thrown himself on that altar many times. But because he is so speedy (dang it! ), lots of what would be sacrifice bunts turn into bunt singles. He also has hit three random home runs, so that’s neat. If you want to smile about something, watch Kelvin Herrera pitch. It’s fun! He started the season at Wilmington, but now spends his evenings making Triple-A hitters look stupid. The 21-year-old is known for regularly hitting 100 mph with his fastball, but he changes speeds effectively and when he is on, he is a flat-out joy to watch. On one hand, I’d love to see him get a September callup once the playoffs are finished, but on the other hand, he is just a wee baby and has thrown more innings this year than ever. Montgomery, like Herrera, is awfully young for Triple-A. He was the 7th-youngest player in the PCL at the beginning of the season, and has struggled to some extent for pretty much the whole season. Some of his starts have been real stinkers – he walked more than he struck out seven times, and gave up five or more runs eight times in 28 games (27 starts). Lough, in his second season in Omaha, is having a much better year than last year. Most of the improvement, I think, can be traced back to the huge cut in strikeouts – his K rate this year is 9.5%, by far his lowest career mark. Sisk has been quite good at AAA this summer, giving up just one hit every two innings so far. His walk rate is higher than at any level he’s pitched at before, so it’s a good thing he has been able to strike batters out, limit base hits, and keep the ball in the ballpark. Catcher Cody Clark has shared a lot of playing time with Manuel Pina and even Sal Perez for a short while. With such inconsistent playing time, Clark’s numbers have suffered quite a bit. Mert had to spend part of this year back down at double-A, but with Johnny Giavotella in the majors, he’s back in Omaha. The only times Mertins has ever had an OBP below .300 were his two partial seasons in Triple-A, which is sad because he’s awesome. Castaneda just rejoined the Royals organization last week after spending most of this season in the Mexican League. He has only thrown 3 innings so far for the Chasers, but they’ve been good ones: No walks, three Ks, no runs, one hit. Castaneda is pretty much a long reliever, but can make spot starts if the need arises. That’s a good piece to have handy, just in case. What do you think will happen to Tejeda after this season? He was hurt in May and spent some time rehabbing with Omaha, and was only back in the bigs for two outings before being demoted. He has been quite useful for Omaha, going more than one inning at a time quite often. But is “useful in AAA” good enough for the Royals to keep him around next year? He’s arb-eligible this offseason and made $1.55 million this year. His few MLB appearances this year were pretty awful, but he probably still has some value, somewhere. Welp, this list got lengthy in a hurry. The Chasers are American Conference champions, which is awesome. A lot of them have been in other playoffs as teammates, which I guess is awesome for The Process. The most awesome part, though, is that it’s mid-September and Omahans can still go see games. The next series begins Tuesday at 7:05. You can buy tickets here, or probably just walk up for them at Werner Park.